Six years after their 5th studio album “Invaders Must Die” was released, drum & bass electronic band The Prodigy are back with their 6th studio album, which looks set to be their last of what has been a successful stamp on British music for the band from Essex. The album titled “The Day Is My Enemy” will be released on March 30th alongside the first single from the record “Wild Frontier”, which has its video available for viewing now. 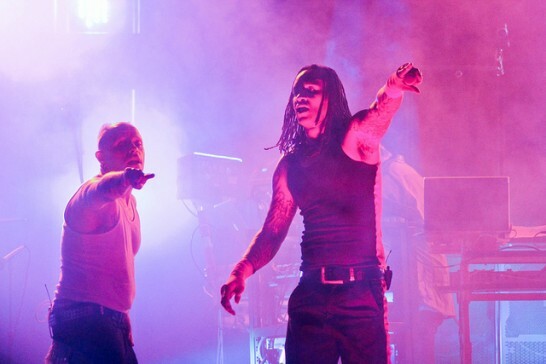 The track first premiered as Zane Lowe’s Hottest Record in the World this week – a show that has always promoted The Prodigy and their new music. The band saw huge success with “Invaders Must Die” in 2009, including a world tour, top 10 chart success with three singles and even their own music festival dedicated to the album at the Milton Keynes Bowl venue. Let’s hope this album is as good as the previous. Whilst we believe The Prodigy are a great piece of British electronic music history, Howlett believes his band is as important to British music as Oasis or Blur. No pressure with continuing the legacy, then! The band will play a host of tour dates in the UK to celebrate the new album, including a headline performance at the ever growing Benicassim 2015 festival alongside good friend of the band, Noel Gallagher and Florence + The Machine. Will you be going to see them? If you have been to one of their gigs in the past, what were they like?